There are nearly 200 countries in the world today. In those countries there are various religions, age groups, social interests and economic classes, which themselves can be considered cultures. Now imagine how often these cultures can change over time and how difficult it is to track. The group’s principal investigator is Adam Cohen, associate professor in the Department of Psychology. He brings with him three other psychology professors (Leah Doane, Gene Brewer, and Kevin Grimm), and Carolyn Warner, professor in the School of Politics and Global Studies. While most studies of culture in psychology view cultures as nationalities, this project will take a broader view of people’s cultural identities as including groups that have values, practices, and identities. The four-year project aims to understand how important different cultures are to people, and how cultural identities change or stay the same over time. There will be a set of studies consisting of focus groups, one using detailed surveys, and one which tracks people over time. A wide variety of culture types will be examined including, race, religion, generational cultures, etc. 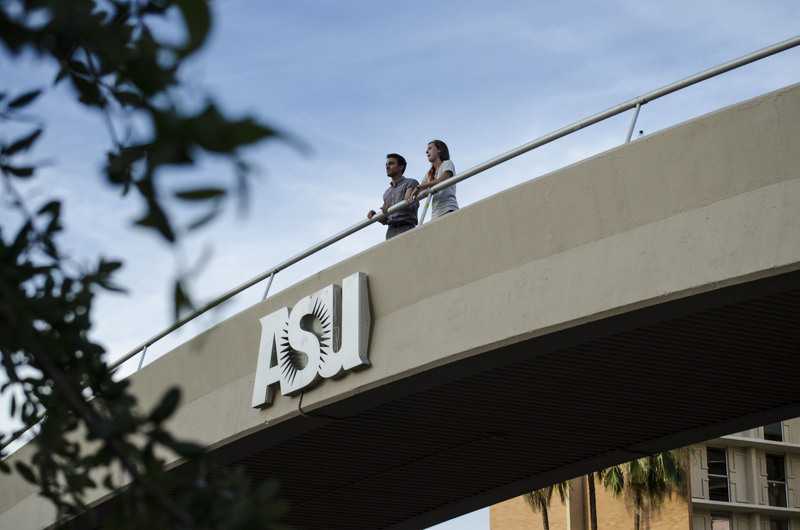 The diverse student population of ASU will make up most of the subjects for this study. The themes for the surveys will emerge from the initial focus groups. The team of ASU faculty will develop questions from the transcripts of these sessions for the next set of surveys, to be fielded on a much larger set of participants. Warner was brought on not only to help develop questions for the focus groups but also to help identify emergent themes from the transcripts, collaborate on creating the large-scale survey and collaborate with the research team on publications. Surveys will be delivered on mobile devices to individuals who self-identify within the various cultures. The ASU faculty will use the results to track how various experiences can influence culture shifts. ASU Gammage was named the 2017 Impact Business of the Year in addition to being awarded the 2017 Economic Driver Award in the Small-to-Medium Business categories. 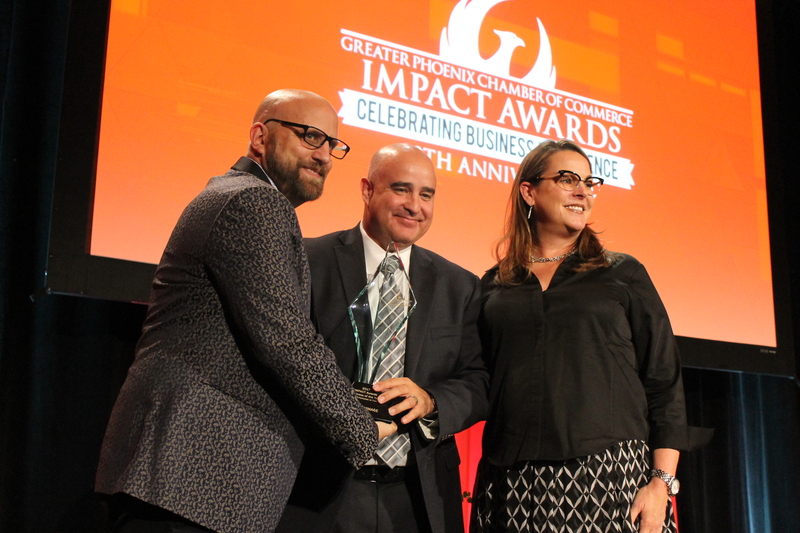 The award honored ASU Gammage for its positive influence on the Valley’s business community, culture and economy, as part of the 2017 Greater Phoenix Chamber of Commerce’s (GPCC) Impact Awards. “We have an amazing and dedicated team that is driven by our mission of Connecting Communities and this honor is a testament to their hard work,” Jennings-Roggensack said. Southwest Airlines won the 2017 IMPACT Business of the Year award in the Large Business category. "Since 2006, ASU Gammage has created more than $550 million dollars of economic impact and more than $100 million dollars in the last year," said Victor Hamburger, ASU Gammage senior director of marketing and communications during his acceptance speech at the 2017 Greater Phoenix Chamber of Commerce's Impact Awards. Hamburger is congratulated by Todd Sanders, president and CEO of the Greater Phoenix Chamber of Commerce, and Ann Becker, vice president and chief procurement officer for Arizona Public Service Company. "Supporting our mission and the ASU charter, ASU Gammage welcomes people from all walks of life and we take seriously the vision and goals of ASU — to create an inclusive home for the arts and assume the fundamental responsibilities for economic, social and cultural health of the communities we serve," Hamburger said. The awardees were honored at the 30th annual GPCC IMPACT Awards luncheon, May 10, at the Arizona Biltmore Resort. In addition to showing the arts performances in multiple disciplines, from Broadway and around the globe, ASU Gammage also drives the Valley’s economy by attracting patrons from across the state whose business helps local organizations flourish as well. Although part of the university, ASU Gammage operates as a self-sustaining business. The majority of its funding comes from its Broadway series and the rest comes from philanthropy. This business model, driven by private support and ticket sales with no funding from the university or the state, runs like a business, but with the heart of a nonprofit. The luncheon honored all eight IMPACT Award winners including the Center for Entrepreneurial Innovation, Crisis Response Network, Inc., ASU Gammage, Redflex Traffic Systems, Inc., Phoenix Sky Harbor International Airport, Southwest Airlines, EPCOR Water USA and Sonora Quest Laboratories.